Energy-efficient equipment can help Maine’s agricultural industry save on energy costs, reduce maintenance costs, and improve productivity. Efficiency Maine offers incentives for specialized equipment found in the dairy and potato-growing industries, including milk scroll compressors, dairy vacuum pumps, and potato storage exhaust fans. Compressors are a critical part of a number of agricultural operations, particularly on dairy farms. Newer scroll compressor systems typically save 15 to 25 percent of electrical costs over reciprocating compressors, and are quieter and more reliable than traditional reciprocating compressors. Variable speed pumps can cut vacuum system energy costs by regulating the speed of the pump to match load and pressure requirements. With an adjustable speed drive, the vacuum pump motor requires less energy during each milking. Potato storage facilities require air movement to remove heat and maintain the required relative humidity. Agricultural facilities storing potatoes can save energy and reduce shrinkage losses with high-efficiency fans. HVLS (high volume, low speed) fans are an efficient way to move large amounts of air and make less noise than standard fans. These fans, with adjustable speed controls, can ramp ventilation up or down to meet demand. Click here for a complete list of agricultural solutions and incentives. Work with an Efficiency Maine Qualified Partner to install high-efficiency agricultural equipment. 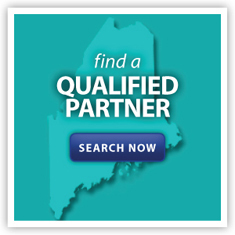 Click here to find a Qualified Partner working near you. As part of the project approval process, you will accept the C&I Prescriptive Program’s Terms and Conditions. If you work with a contractor that is not yet a Qualified Partner, urge your contractor to find out more information here.